Want to preview stained glass in your church? If you want to better visualize the impact it will have on your worship space, ask us if you can preview stained glass in a photo of your church. 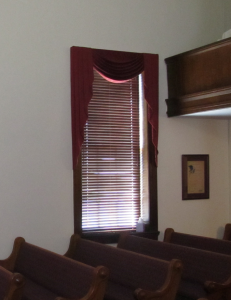 Step 1: Take a photo of the inside of your church, showing your current windows similar to the photo provided. Step 2: Choose the style window from our website that best fits what you would like to see for your church. Step 3: Email the photo to us along with your window selection to: john@lynchburgstainedglass.com. Please include the name and location of your church along with your contact information. 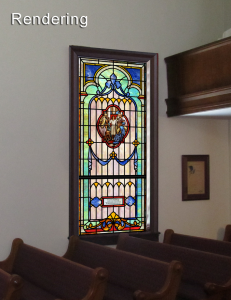 We will insert the window design and return it to you as a preview to use in initial meetings or discussions among church members. If you would like to receive a project cost, we need a little more information. Please call us at 800-237-6161.